2. Add the strawberries, sugar and cornstarch. 3. Dissolve the gelatin in water and add to the pan. 4. Simmer until thick and keep aside. 5. To make the custard, whisk the egg yolks, sugar, milk, cornstarch and vanilla in a bowl. 6. Place on top of a pan of boiling water and stir until thick. 7. Switch off flame and add butter. 8. Mix well and remove. Keep aside to cool. 9. Layer the wafers, strawberry sauce, custard and sliced bananas on the bottom of a glass bowl. 10. Top up with whipped cream. 11. Garnish with wafers, bananas and strawberries. 12. 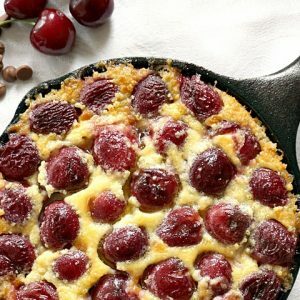 Keep it in the fridge for 4 to 5 hours and serve. 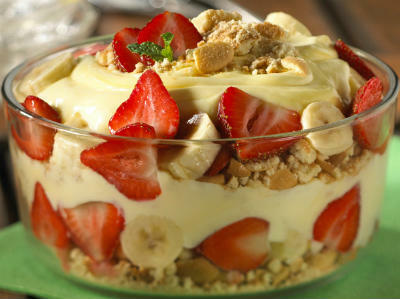 Feel free to comment or share your thoughts on this Strawberry Banana Cream Trifle Recipe from Awesome Cuisine.